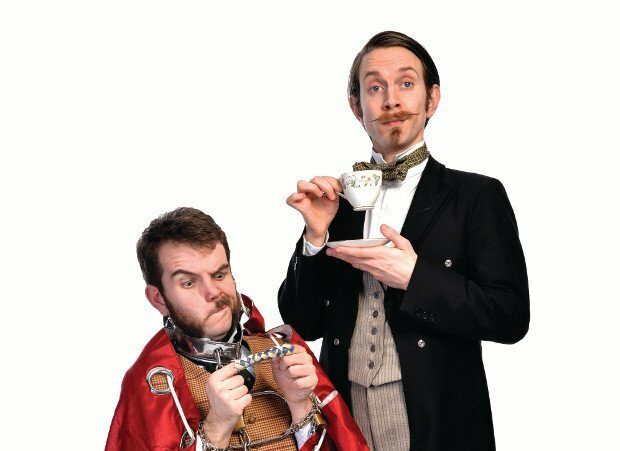 Steampunk magic double act Rhys Morgan and Robert West are back with a brand new show for children, and they have a big room to conjure a lot of fans into. Hopefully they manage it as the run goes on, because the duo are a sharp and characterful pair with a repertoire of exciting tricks and punchy chat which gets the young crowd onside. The set is laid out like a Victorian ringmaster's dressing room, and the frock-coated duo – West in particular – play up to an irascible dislike of children. They bicker with each other and chatter with the kids in the crowd, building up a random series of question and answer responses to queries like 'who is the tallest person in the world?' and 'who is the best person in the world?' (the kids randomly conjure 'David Bowie' and 'Rag'n'Bone Man' as options for the latter) which will come in useful later. Away from the winning and very amusing rapport they build with the children, Morgan and West have a bunch of stunning tricks which are issued in an almost off-the-cuff manner; the blossoming red umbrellas of all sizes which burst forth from inside one simple, modest-sized parasol, or the small glass of strawberry milkshake which pours and pours until glasses and jugs and flutes are filled. There are a few classics, too, including an escape from a locked box behind a curtain and a Morgan-containing box being sawn in half at the end, offering a highly visual show which mixes the drama of magic with sparky, youthful humour. Underbelly Med Quad, until 27 Aug, times vary, £10.50–£11 (£9.50–£10).